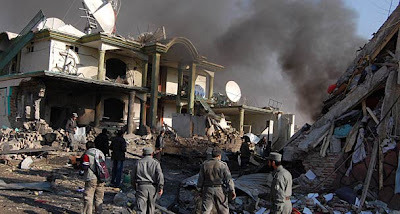 KABUL: A suspected suicide bomber struck an upmarket district of the Afghan capital Kabul on Tuesday, killing at least eight people, including four women, and wounding another 40 near a guest house, government officials said. ‘I believe it was a suicide attack. So far 16 wounded and one dead have been evacuated to our hospital, the military hospital,’ defence ministry spokesman General Mohammad Zahir Azimi said. ‘They are all civilians, including men, women and children,’ he added. ‘We have received four wounded so far,’ said Ahmad Shah Shokohman, a senior doctor at the Wazir Akbar Khan civilian hospital. Ambulances were seen rushing from the scene of the blast where the cloud of black smoke and dust hung over the upmarket district of Wazir Akhbar Khan, home to many foreign embassies and aid groups.